This entry was posted on December 12, 2018 by Goplasticpallets. It’s that time of year when many businesses reflect and take stock of the year behind and plan for the year ahead, and Goplasticpallets.com is moving into 2019 stronger than ever. Celebrating its 25th year of business this year, Goplasticpallets.com has recorded sales in excess of one million plastic pallets, pallet boxes and containers in the last 20 years alone, which reinforces its position as the UK’s largest plastic pallet supplier. The company has continued to grow from two to now 29 members of staff, including an experienced management team and highly knowledgeable sales force. Between them the company’s sales experts boast 100+ years’ experience within the pallet industry, as well as expert knowledge. 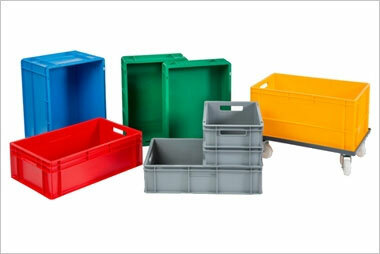 Goplasticpallets.com has further strengthened its relationships with leading European plastic pallet and box manufacturers this year. 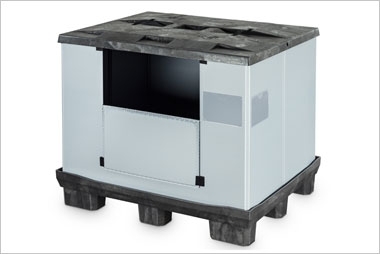 First saw the signing of the company’s fifth partnership agreement, this time with Italian manufacturer JCOPLASTIC which secured Goplasticpallets.com sole UK distribution rights for an impressive range of industrial and agricultural rigid pallet boxes. The summer then saw the company consolidate its partnership agreement with Belgium-based manufacturers Smart-Flow and Gamma-Wopla who have given Goplasticpallets.com exclusivity in the UK for distributing more than 50 of its plastic pallets and small containers. Another major accomplishment for Goplasticpallets.com this year was becoming an Accredited Exporter of Plastic Packaging Waste. This means that when customers no longer have a need for their plastic pallets or boxes, or they have come to the end of their long working life, Goplasticpallets.com can return them to their recycling plant in Belgium; saving customers both the hassle and cost of disposal and ensuring their products are recycled in a sustainable way. This is particularly pertinent given the huge media focus on plastic pollution this year. 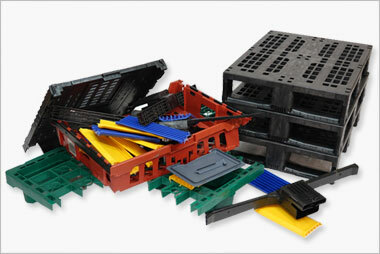 In fact, Goplasticpallets.com was one of the few plastic pallet suppliers to speak out to counter the abundance of ‘ditch the plastic’ campaigns that have appeared by highlighting the important role plastic plays in our everyday life. After all, not all plastic is ‘bad’ and it’s crucial that we all distinguish between ‘bad’ single-use and ‘good’ recyclable plastics. 90% of the plastic pallets Goplasticpallets.com supplies are made from recycled material and can be reused repeatedly for often 10 years, or more, and then recycled at the end of their long working life. They will also be exempt from the new Plastic Packaging Tax, introduced by Chancellor Philip Hammond in his autumn Budget which will tax all produced or imported plastic packaging without at least 30% recycled plastic from 1 April 2022. Just one of the plastic pallet supplier’s ‘stand out’ projects this year included delivering 19,750 plastic pallet boxes to Europe’s leading dry pet food manufacturer, GA Pet Food Partners, for use in its new fully automated warehouse. The team had a huge task on their hands coordinating production with CABKA_IPS, the manufacturer in Belgium, and organising delivery schedules with LKW WALTER. 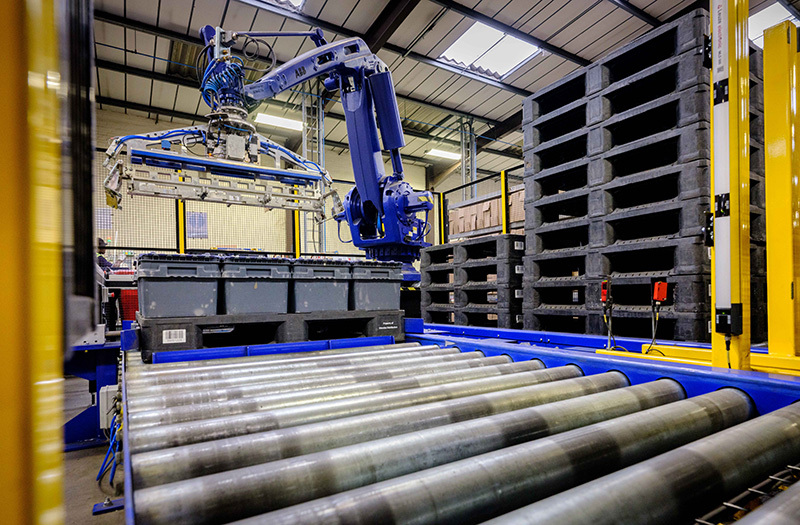 The large-scale logistics operation saw all 19,750 plastic pallet boxes and lids transported by full trucks – more than 470 individual loads – from the manufacturing plant in Ieper in Belgium to GA’s distribution centre in Chorley in Lancashire over 30 weeks. 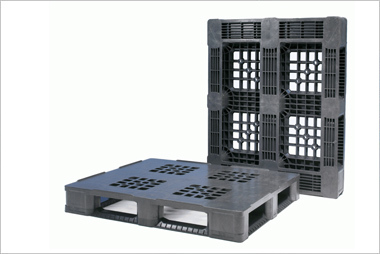 Another significant project saw Goplasticpallets.com help time-critical logistics business Menzies Distribution reduce its logistics costs and improve internal supply chain processes by providing a long lasting plastic pallet solution and invaluable product advice. 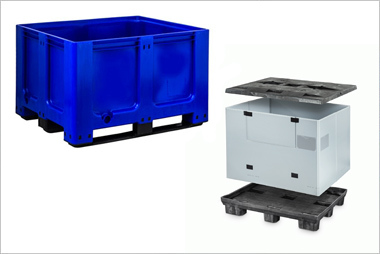 Goplasticpallets.com supplied 4,680 of its APB 1210 Pool Perforated 5R pallets, a heavy duty, full perimeter design, which in addition to its competitive price offered the benefit of saving space in storage – crucial for Menzies’ busy packing environments. So, what does 2019 hold in store for Goplasticpallets.com? 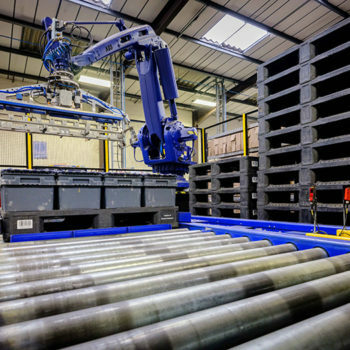 The rise in automation in the manufacturing sectors is definitely one opportunity given the crucial role plastic pallets play in ensuring a smooth and efficient production line. This year Goplasticpallets.com supplied plastic pallets to one of the UK’s largest supermarkets for use in an automated storage and retrieval system and is working with a number of other large retailers on similar projects. Sustainability will remain a key area of focus for 2019 both in-house – looking at new ways to reduce waste – and demonstrating the company’s ‘green’ credentials to customers. What is certain is that Goplasticpallets.com has exciting plans for the year ahead! Call us on 01323 744057 to find out how we can become your plastic pallet supplier for 2019.